Improving Health and Well-being for over 60’s! Keeping active into older age is the key to staying fit, mobile and independent. All it takes is to participate in short bursts of moderate activity each week for a healthy and active lifestyle. The Active Ageing programme not only promotes physical activity but is a great way to meet new people and try something new! 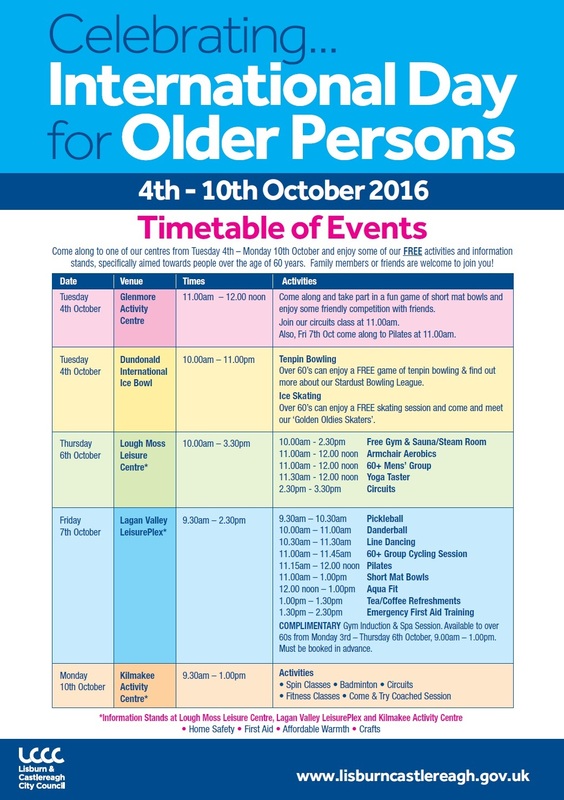 Also, to celebrate International Day for Older Persons, why not come along to one of our centres from Monday 2nd - Friday 6th October and enjoy some of our FREE activities specifically aimed towards people over the age of 60 years. Family members or friends are welcome to join you! There is no need to register, just come along and have some fun! Remember - age is just a number!!! For further details, please click here. Walking Football for the Over 40s! Come along and improve your fitness & enjoy a fun kick around with friends! Please click here for details.